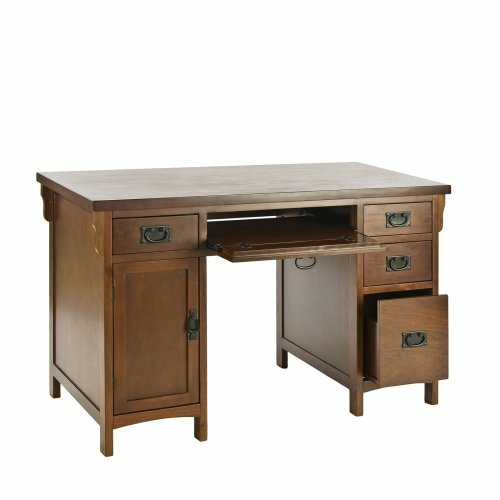 Finished in brown mahogany and constructed with traditional mission styling, this desk is sure to enhance any room. Multiple drawers combine with a large cabinet to make this desk the perfect solution for cleaning up your cluttered work area. The right side features three drawers that get progressively larger from the top down ending with a deep drawer with storage for larger items. On the left a small storage drawer, perfect for pens and accessories, sits directly above the cabinet that is perfect for holding your computer tower or other large items. Lastly, the keystone of this desk is the slide out keyboard drawer with fold down face over the seating area that provides easy typing access or additional storage. Crafted with solid Asian hardwood legs and durable birch veneer ensures many years of use and beauty. This handsome grand scale desk with small- space friendly footprint features 4 drawers, 1 keyboard tray, and 1 cabinet total and antique bronze "knocker" handles. Dimensions include: Overall: 47.75" W x 23.75" D x 30.25" H; Drawers (listed from top): 8.5" W x 13" D x 2.75" H (2 drawers), 19" W x 14.5" D x 2.75" H (1 drawer), 8.5" W x 13" D x 3.5" H (1 drawer), 8.5" W x 13" D x 7" H (1 drawer). This one-of-a-kind item approximately weighs 99 pounds and can Supports up to: 50 lb. (desktop), 30 lb. (tower cabinet), 10 lb. (each drawer), 7 lb. (keyboard tray). Only quality materials and manufacturing will do. Product materials include: Materials: Solid Wood; MDF w/ Veneer; Mahogany Finish. Assembly: Required. Made in China. Materials: Solid Wood; MDF w/ Veneer; Approx. weight: 99 lb.